Debbie had to do things a lot differently before she got the spectacular breakthrough she was looking for with this troubled horse. I’ve gone through our emails this morning to get the story properly in my mind and I could feel Deb’s despair in almost every line. It was difficult for her to see where to start and what she could do to help Sam. 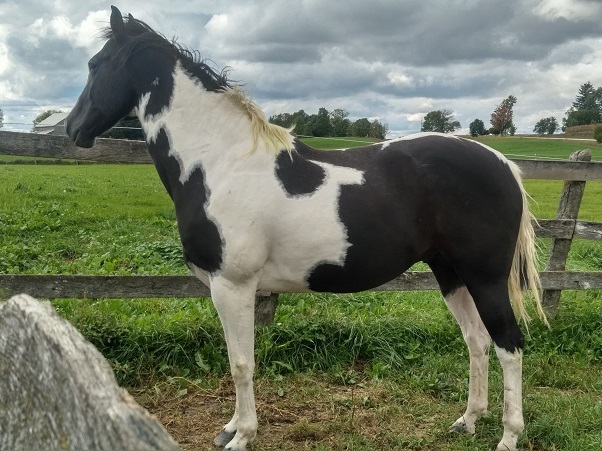 Debbie was strongly drawn to this horse at the end of April 2018 and bought him sight unseen. 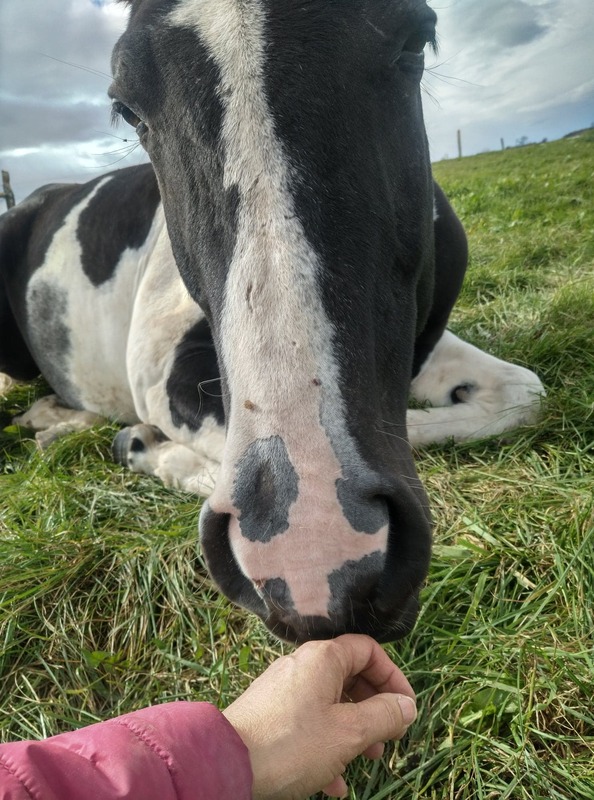 When he arrived she described him as “not safe to be around” – he was physically unwell and she had the vet to him – but it was the handling issues that were really scarey. He had zero trust in humans. His feet were in terrible condition, but she couldn’t even get them off the ground, let alone trim them. He was jumping out of his skin and dangerous to lead. The only reason she hadn’t given up already before she got to us, was that she’d been guided to him and it’s simply not her style to give up. In her emails to me, it was clear that she had a traumatized and very stressed horse to deal with and it was incredibly important that she be able to keep herself safe. 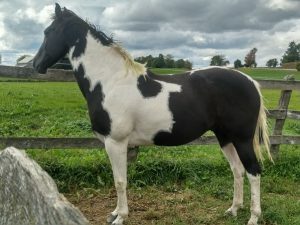 So we started off by putting him in my reiki grid for a constant flow of healing energy and put Deb onto our horse meditation program with the goal of creating a calm bond together. Email after email came from Deb, described how her other horses were enjoying both her meditation times and the horse exercises that we do with them in the Quiet Mind program, but Sam wasn’t faintly interested – walking off, arched back, head up in the air, constantly tossing his head in a very disturbed manner. We decided that even LOOKING for the connection was too much pressure for him. She had to release any expectations of doing the physical exercises that are scattered through the Quiet Mind program, find her own peaceful centre and be open for him to come to her when he was ready without any expectations of when that would be. They were up and down like a yo-yo. Then the next day he ran off when she came out and was head tossing again. The breakthrough was sudden and spectacular on Day 23. He allowed Deb to come up to him when he was laying down and not only that, then laid flat out and went full on into sleep. It takes tremendous confidence for a horse to do that – they are really making themselves vulnerable when they lay down close to you. He was so deeply asleep in the video that Deb sent me that it looked like he hadn’t slept in a very long time. From my experience, Deb will be able to expect a big health benefit from that amount of relaxation too. Deb’s persistence with Sam is an inspiration to all of us. What she has done with Sam is created a deep and very special Comfort Zone together from a horse who was in utter traumatised chaos. NOW she has a strong base to work from. From here, first she needs to make this relaxation robust. Then she can go through into the Fast Track program, where she’ll step by step and systematically expand that Comfort Zone into everything that she does with Sam – Releasing old trauma along the way, Re- Learning and Re-programming as she goes – cementing this beautiful bond that she’s laid in as a foundation and using it to do whatever it is that they’ll end up doing together. Beautiful, beautiful result Deb – congratulations on making a phenomenal start to your relationship with Sam with SUCH an enormous breakthrough for him. You don’t need to have a traumatised horse to benefit from the Quiet Mind program. My inbox is full of gorgeous stories of things that have happened – ordinary people being extraordinary – some of which I’ve put in the testimonials. If you haven’t seen 21 Days to a Quiet Mind, you can read all about it here. Beautiful story and wonderful to read about the perseverance in releasing Sam’s trauma. He’s so fortunate to find Deb and Jenny.